One of the things I love about new media is how fluid it is. You never know where an interesting link might take you -- or where you may come across compelling content. You could be reading a blog post on HuffPost that links to a story on The Atlantic that references and links you to a study in some obscure journal. Or you could be looking at digg or your Facebook wall or a Twitter stream and come across a link that brings you to HuffPost. It's one of the reasons we've put a lot of work into making it possible to access HuffPost wherever you go -- via our mobile apps -- and on other sites where you may spend a lot of your online time. And that's why I'm excited about the new app we've developed for Yahoo!. Over 260 million people use Yahoo! email accounts and 550 million people visit Yahoo! every month -- and now they can keep up with HuffPost without having to leave their Yahoo! homepage, simply by adding our new app. It's a cool tool that lets you quickly flip through all our different sections, as well as check out the most popular stories on the site and preview the latest posts from our top bloggers. It gives users a taste of our fast-paced, constantly-refreshed approach to delivering news and opinion. Click here to install the new Yahoo! app. We've also made it so you can now use your Yahoo! ID to quickly sign in to HuffPost, and to join HuffPost Social News so you can easily link up with your friends from Yahoo! who are also part of the HuffPost community. Want to check out what they are reading or make sure you see their latest comment? 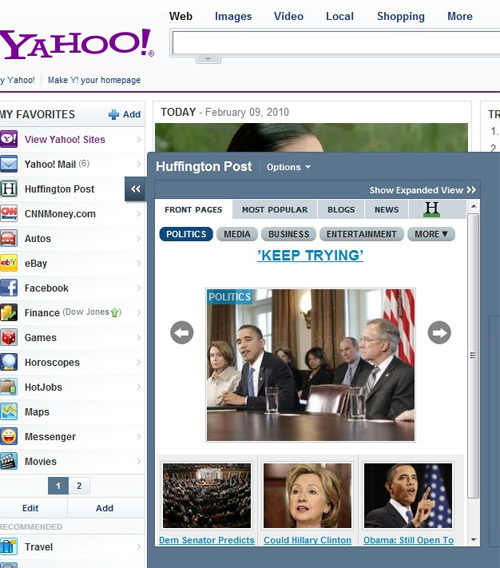 Log onto HuffPost Social News using Yahoo! and that happens automatically. 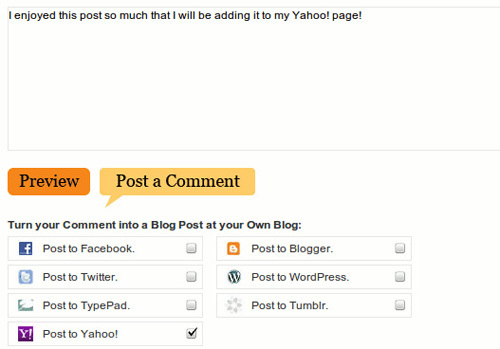 And when you write a comment, you can, with one click, share it with your Yahoo! friends and contacts -- just like you can share to Facebook or via Twitter. We've also expanded our editorial relationship with Yahoo News!, which will be featuring more stories written by our HuffPost reporters and one-of-a-kind takes from our many bloggers. These will be featured throughout Yahoo News!, including on its opinion page. So if you Yahoo! : add our app to your homepage; easily integrate your Yahoo! account with HuffPost by clicking on the Yahoo! button on our homepage nav bar; and check out the HuffPost stories featured on Yahoo! News. And, of course, let us know what you think. We love getting your feedback.